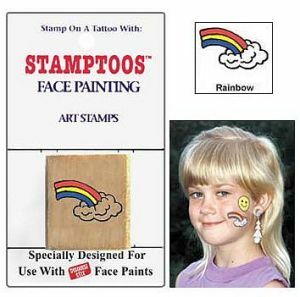 Face painting stamps are similar to traditional business stationary stamps. They are used by stamping onto the human skin instead of paper (as in business stamps). For the face painter they can be very helpful at large events where one has decided to paint cheek art, to get through long queues of customers. They are great for young kids who quickly get bored and start wriggling around. 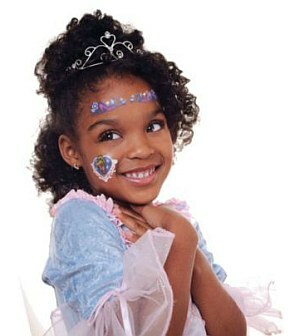 A face paint stamp goes on quickly, and can then be filled in with various colors to enhance the design. Face painting stamps work in a very simple way. They are normally made of foam. This enables the stamp to flex to the shape of the skin on which the design is applied. 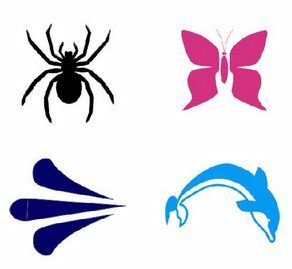 They are manufactured to be soft enough to adapt to the surface they are being applied to, while still transferring the design onto the skin. Stamps that are effective are simple designs that kids love and yet without complex patterns that can smudge during application. 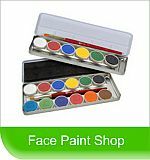 1) Apply the required color face paint to the face paint stamp, and make sure the face paint is loaded. 2) Apply the paint loaded Stamp to the persons face or arm. 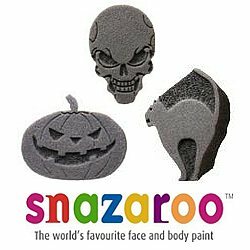 Snazaroo Stamp Sets are ideal for large volume face painting events, and for beginner painters. Snazaroo EVO stamps are the perfect size for cheek art designs. Stamps are made from foam and apply easily to the skin and clean with a baby wipe. Evo stamps are used with normal face paints. Stamps are great for those that have trouble with cheek art and freehand designs, or when fast face painting is a must. 1) Load the stamp by applying the required face paint color. 2) Then press against the skin leaving the stamp design. Stamptoos are tattoos created with the help of simple, bold outlines transferred onto the skin from a Stamptoos Art Stamp. 1) Dip black Disguise Stix into water. 3) Pat the sponge onto the stamp to sort of ink stamp with the black coloring on the sponge. 4) Stamp design outline onto skin. 5) Paint in the desired colors needed to complete the design using a brush loaded with the Disguise Stix coloring. 6) Apply glitter to design if so desired. Speak to your client or school and pre-order exactly what they need for their next function or sporting event.